The Texas Department of Transportation Environmental Affairs Division published a "A Field Guide to Gas Stations in Texas" in 2003, highlighting some of the early gas stations in Texas. It is an extensive look at the marketing, use and design of early gas stations in Texas. 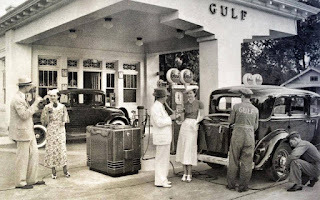 Even though the Texas landscape is varied and had a great deal of influence on the architecture of a particular area, gas stations didn't always follow, making sure to establish or incorporate a predicable corporate image for those early petroleum companies. As cars became less of a luxury and more commonplace, oil companies staked their claims along the country's streets and highways to refuel America's cars. America's former drive-through urbanism has actually led to some useful adaptive reuse opportunities. It's long been recognized in San Antonio that gas stations and service garages of the early 20th century can provide for some exciting reuse opportunities. The large canopies that used to provide shelter for cars and fuelers can alternatively be used for providing shelter to those fueling up on food. Open floor plans that allowed cars to move about a property now provide ample variety for seating and restaurant layouts, with minimal site work needed in some instances. Houston's Eight Row Flint in a former Citgo station. Now, fuel up on whisky and tacos. Across Houston there are great examples of gas stations or garages that have been converted to restaurants. Eight Row Flint opened at Yale and 11th Street in the Houston Heights neighborhood last year, fueling Heights residents and visitors with whiskey, beer and tacos. This wasn't a redevelopment of a classic gas station or garage like Berkley, Michigan's Vinsetta Garage, (see what it used to look like) but instead a remodel of a run of the mill, abandoned, Citgo station. Petrol Station. If you're visiting, get a burger. Petrol Station in the Garden Oaks / Oak Forest neighborhood is a a popular spot for burgers and beer, replacing a garage with taps and a grill. Retrospect Coffee Bar at the southern end of Houston's Midtown neighborhood is another former gas station that's gearing up to serve up gallons of fuel, only now in the form of coffee. The former Gulf service station is currently being outfitted to serve Texas coffee, beer, wine and other local foods. They are still receiving their permits (After anticipating a Fall 2015 opening), and have been working to utilize a shipping container as part of their building. Liberty Station on Houston's Washington Avenue was once a service station, now serving beer and food truck grub. The Houston Heights lost out on a great restaurant prospect when the old service station at the NW corner of White Oak Drive and Cortlandt was torn down for a large single family home. The Houston Heights has another old service station that is slated to be utilized as a restaurant located at 11th and Beverly streets. The building has sat vacant for at least the past decade, and was never utilized by the now-closed Zelko Bistro. Thankfully, former Liberty Kitchen chef Travis Lenig has plans to utilize both sites for his future Field and Tides restaurant. Finally in the Heights, Ritual, the new Texas-inspired restaurant at the corner of Studewood and White Oak Drive, has made a home in what was a former Conoco station. Before Ritual, owners of The El Cantina transformed the Conoco station into an expansive restaurant. So, what about other gas station sites that might make the transition from pumping gas to pumping out Houston cuisine? There are remnants of another old gas station at the corner of Airline and Kern Street between the Woodland Heights and Brooke Smith subdivisions. Now, the property is up for sale, and is even advertised as "ideal for Retail/Bar/Auto shop." In Houston's First Ward, a building that is currently hosting sporadic weekend garage sales and stores moving trucks, would make an excellent location for a restaurant should the owners ever entertain selling. Unfortunately the building is in a bit of disrepair, including the canopy. In the Near Northside an old gas station on North Main has a "For Lease" banner posted. You can see that whoever owns the building had a railing installed on top of the building's canopy. This site would probably offer great sunset views of Downtown Houston should a staircase be added. Fixers Automotive (a great place to get your car worked on, based on Yelp reviews) looks to be an old service station, as well as International Bonding just north of Downtown Houston. Finally, Empire Cafe (the site of my wife and I's first date, so it has a special place in my heart) in Montrose looks as if it were an old gas station, however, it is actually the former Hollyfield Laundry and Cleaners. Not a gas station, but a remnant of past drive-through urbanism that has benefited fans of (now) walkable urbanism and good food. If there are others around town, please leave a comment and location, and I'll include them! This post was a good read and i agree with you on the point. this is a very good initiative. hopefully it reaches to its completion. keep us posted with more. Find property in Mystic CT. We have a wide range of Mystic houses and flats for sale or to rent from top USA estate agents. Visit Groton, CT on your next vacation and explore beaches, restaurants & many other attractions of great things to do and see in any season. Shell or Exxon, Mobil You know how you can put some gas in your car and it seems to gives more power and a better and smoother ride, but then you can try gas from another station which seems like it makes your car run like crap. Find out more: https:tips4car.com .